Brain Trainer mini – Mental Workouts To Go | OhGizmo! Thankfully the fitness ‘fad’ that sweeped the continent a few years ago is still going strong from what I’ve seen. But these days it seems even more in vogue to keep your mind in top condition as well. The Brain Trainer mini is a palm-sized device designed to improve your mental capabilities as well as your memory by exercising the prefrontal cortex. Flash: memorise the 4 numbers that appear on the screen quickly. Sequence: memorise the numbers that move across the screen quickly. Catch: catch the block as it moves from left, right, top or bottom. Blocks: memorise the block shape that appears for an instant. It’s no Gameboy or DS but by playing even these simple games for a few minutes every day you’ll supposedly improve your attention and memory skills and help your reactions become swifter and more accurate. 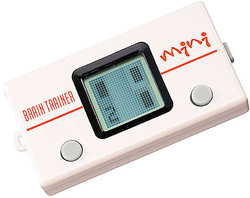 The pocket-sized Brain Trainer mini is available from AnyToys UK for about $20. This is BS and everyone knows it. The only product in this category that I have seen that actually has real science behind it is Posit Science The Brain Fitness Program. The exercises are long and take 40hrs to complete, but well worth it from what I can gather. Its like working out, you need to put the time/effort in to see results. All these other products are like the infomercials you see on TV…crap.